The Ole Miss Alumni Association is ringing in the new year by offering new perks for members of the Future Alumni Network, the Association’s membership option for students. Easing the burden of paying for printing, scantrons and blue books, the Alumni Association now offers all student members these perks for free. At a cost of 15 cents per sheet, printing on campus can quickly get pricey when students are assigned lengthy projects or midterm papers. 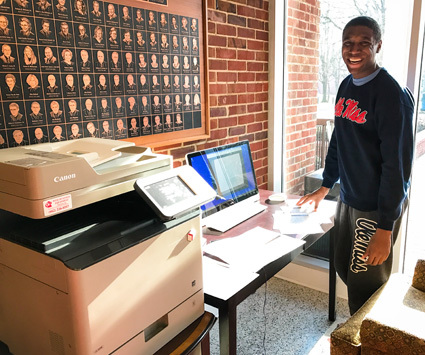 With the Alumni Association’s student membership option, students have access to free printing Mondays through Fridays from 8 a.m. to 5 p.m. Not only are students armed with access to a reliable printer, but they can also receive up to two scantrons and blue books per day. In addition to the cost of printing, the ongoing construction of the Student Union has eliminated convenient access to scantrons and blue books. Student members enjoy several other perks, such as discounts at local and national retailers and access to special events, and come at a cost of $25 per year, or $75 for four years when paid in full. For more information on how students can join, please visit olemissalumni.com/students.